You might not be happy to see Janea Martin lingering around your car, or the calling card from the City of Oakland she leaves behind. But you should know that she is helping you contribute to the well-being of the city by providing funds for libraries and public parks. 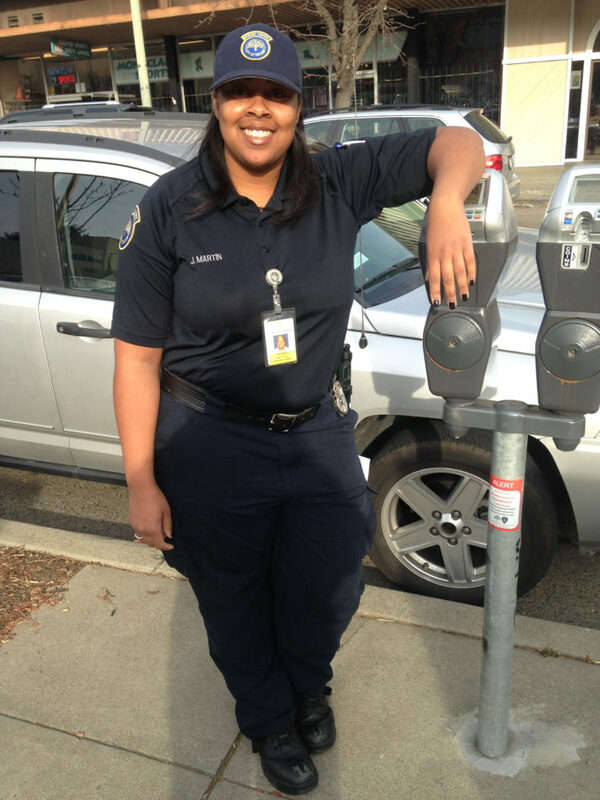 Oakland has 64 parking enforcers — 30 men and 34 women. Collectively they write a somewhat heart-stopping average of 26,477 tickets per month, according to Sean Maher, a program analyst for the Department of Public Works. Despite rumors to the contrary, often shared when one has gotten a ticket, Maher said there is no quota for parking tickets. Technicians go through a three-week training that is very hands-on and very intense, including initial encounters with people posing as irate drivers. Martin, 28, began working as a parking control technician in August 2015. She is part-time, working towards a full-time position with plans to eventually become a police officer. Parking enforcement officers are civilian employees of the police department. Technicians carry handheld GPS devices with emergency buttons that can summon police backup if they feel their physical safety is threatened. However Martin explained that the enforcement officers are trained as good communicators, problem solvers, and, most importantly, de-escalators. “I enjoy the people aspect,” Martin said. She chooses to get out of the parking control vehicle and walk her route. She said sometimes people stop and speak with her and ask questions. But the angry drivers are unavoidable. In a typical example, she was placing a ticket on a car when the owner came running up. He became agitated when she explained that once the ticket is printed, she has to issue it. “He started kicking his car so aggressively that he put a dent in the driver’s door,” she said. Then he got his car, slammed the door and sped off. She said such scenes happen frequently because drivers mistakenly believe if they return when she is still there, they can stop the ticket. They can’t. In spite of the training, Martin said it’s not always easy to maintain decorum and professionalism. On the other hand, she understands that she has no way of knowing what may be going on in that driver’s life. But she also wants drivers to know that parking control technicians are people with their own challenges. In her case, she is a single mother, who until recently was working three jobs just to make ends meet. She is also trying to complete her criminal justice degree at Cal State East Bay. To become a parking control technician, applicants should be able to pass a drug test, have no felony convictions, and possess at least a high school diploma. Starting pay is $21.63 per hour, an healthy alternative to other entry level positions in retail or food service. She said that many drivers do not know the parking laws and the vehicle code, and this often results in citations. For example, double parking, even momentarily, to pick someone up or drop them off, is a parking violation. Her advice? “Be aware of where you’re parking.” Read the signs, look for painted curbs and pay attention to zones for taxis, the disabled and/or loading zones. While she has to issue the ticket once she starts writing it, she said she is always willing to talk to drivers about what she is doing and why. Despite the challenges, Martin said she enjoys the work; the chance to work outside, meet and greet people, and even generate a little revenue for the city of Oakland.